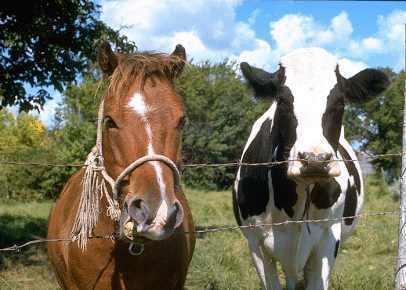 Eating cow meat vs. horse meat: Is there an ethical difference? It seems Canada’s popular Food Network channel came under criticism this weekend when word got out about top-rate television show Top Chef. Tonight’s episode challenges competitors to use horse meat as a main ingredient in their prepared dishes. I don’t love that. (Why are we adding species to our menu rather than seeking out more compassionate ways to treat the ones we already devour?) But here’s why I’m not encouraging everyone I know to boycott Top Chef or send letters to the Food Network. Cows, sheep, and pigs are every bit as sentient as horses, and yet we have no qualms about cooking up a side of beef or rack of lamb. It doesn’t make sense to spare some, cause suffering to others. But! In other news this weekend: my new favorite animal welfare organization, Farm Sanctuary, kicked off its vegan-focused Just Eats tour. The nonprofit’s president and co-founder, Gene Baur, is traveling across the country in a VW van, spreading the joys of compassionate consumption. While there’s no mention on the JustEatsTour.org website of the heartbreaking suffering many farm animals endure, there is plenty of information out there for anyone curious about life for a typical chicken, cow, or pig. Instead, the Just Eats tour explains how, with a few conscious choices, your actions can help eliminate suffering. I do love that. Why? Because veganism is not about making other people feel guilty — or even hungry. It’s about making all species, including humans, feel happy and excited about food. Before I became a vegan, I was under the impression that such a diet was boring, flavorless, and unsatisfying. I thought I’d never again look forward to a meal. But because I love animals, I was committed to sticking to it. Fortunately, I was wrong: veganism can be delicious. I’m hoping the Just Eats tour will help others reach that conclusion more immediately than I did. From decadent baked goods to savory entrees, I’ve had vegan meals that rival the best meat and dairy products I’ve ever tasted. Only one area lacks: cheese. My fingers are crossed all kinds of ways that during its three week tour, Farm Sanctuary’s Just Eats crew will happen upon a product or recipe that changes my life — a cheese substitute so tasty I can once again feel culinarily complete. That said, I’d eat a meal of horse meat cut from an animal that was treated well and slaughtered humanely before I’d swallow a slice of smoked gouda made with milk from the average dairy cow. Because nothing, not even gouda, tastes as good as preventing suffering feels.